Ahead: Judicial Activism or ....? 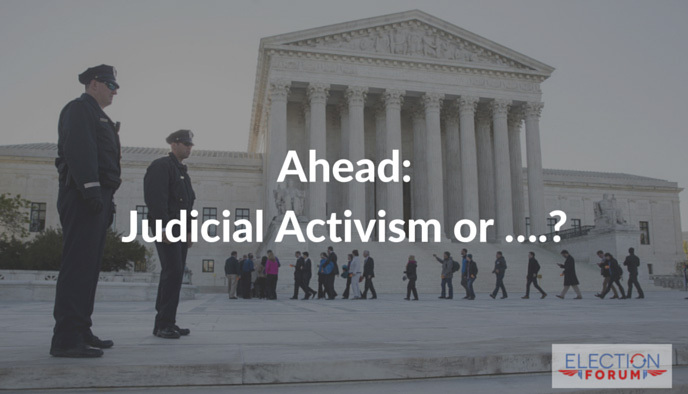 Ahead: Judicial Activism or ….? There are a lot of big, important cases lined up for the Supreme Court to hear. Only 5 unelected judges need to agree to change or impose a national policy on these issues coming up. We need to be watching and praying that the Supreme Court upholds the Constitution in these cases. And we need to elect a President who won’t appoint activist judges. Let’s look at the very important case challenging teachers’ unions. There are 25 right-to-work states, where teachers do not have to be members of a teacher’s union. But many of these states still require all teachers to pay union dues. 26 states require teachers to pay union dues – whether they are members or not. California is one of those states. Non-members in California are forced to pay $1200 a year to CTA, money that is going to representation they do not have and political activism that they may oppose. Rebecca Friedrichs, a fourth-grade teacher in Buena Park, is challenging the constitutionality of compulsory union dues before the Supreme Court. Friedrichs is the lead plaintiff and is joined by 10 other public school teachers from California. Their argument is that the “freedom to associate with organizations,” which has been established by the Supreme Court, means that we also have a freedom to NOT associate with organizations. Pray for the Supreme Court. The Justices have read the teachers’ briefs as well as the unions’ briefs. Since they make their decision on the day of oral argument, this time period right now is crucial. Please pray that the Justices will adhere to the Constitution, not their political ideologies or political pressure and recognize the right of freedom of choice. Also, please sign our petition to stop predator teachers, who are protected by tenure laws: sign here.